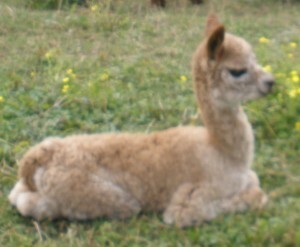 Peaceful Heart Alpacas is pleased to announce the birth of our lastest cria, Peaceful Heart´s Gabriel. Gabriel´s parents are both new alpacas to our farm, but they have a proven track record of producing excellent crias together. 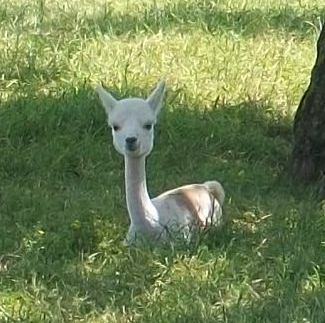 Their cria Rivanna´s Reflection won Reserve Color Champion at the VAOBA Expo at just 7 months of age. 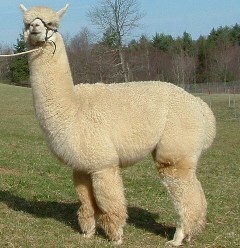 Gabriel is the product of great genetic lines, Bueno, Hemingway and Victor. 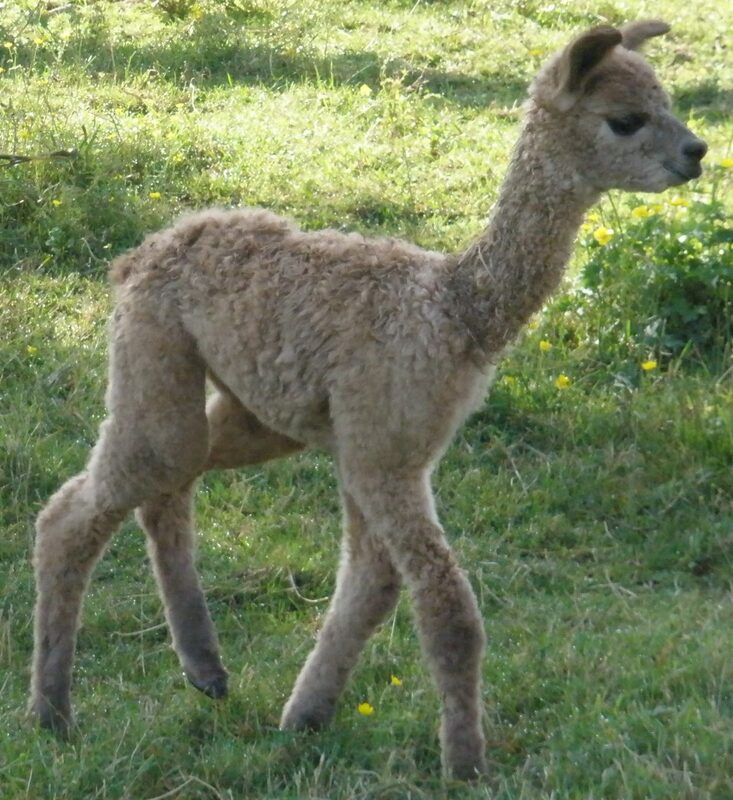 His dam AHR Francesca and his sire Snowmass Casanova´s Arch Angel are both lovely fawn alpacas with great density and crimp in their fleece and solid bone structure. Gabriel has the great fleece, form and density, that give us confidence he will do well in the show ring. Gabriel is the fourth male cria, out of the 5 alpacas born this spring at Peaceful Heart Alpacas. You can see Gabriel playing in the front pasture near the store with his buddies Milton, May, Coriander and Becket. We hope to see you soon. 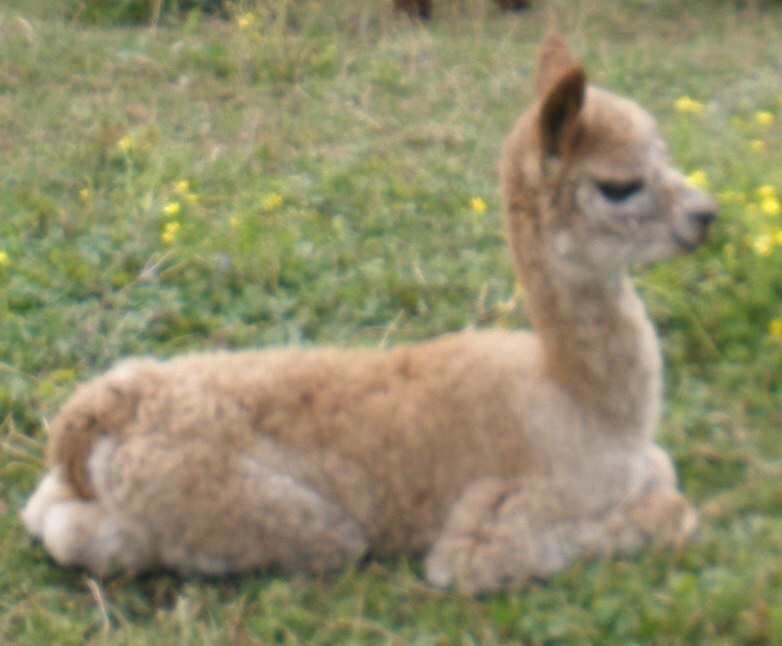 Peaceful Heart Alpacas is thrilled to announce that our champion herdsire Lord Tennyson has given us another beautiful baby boy, Tennyson´s Becket of Peaceful Heart. Becket is a lovely medium fawn alpaca with dense bundles of fleece already showing wonderful crimp. We can´t wait to see how he and his brother Milton develop. Becket´s dam is our beautiful Henrietta Ruth, “Ruthie”. 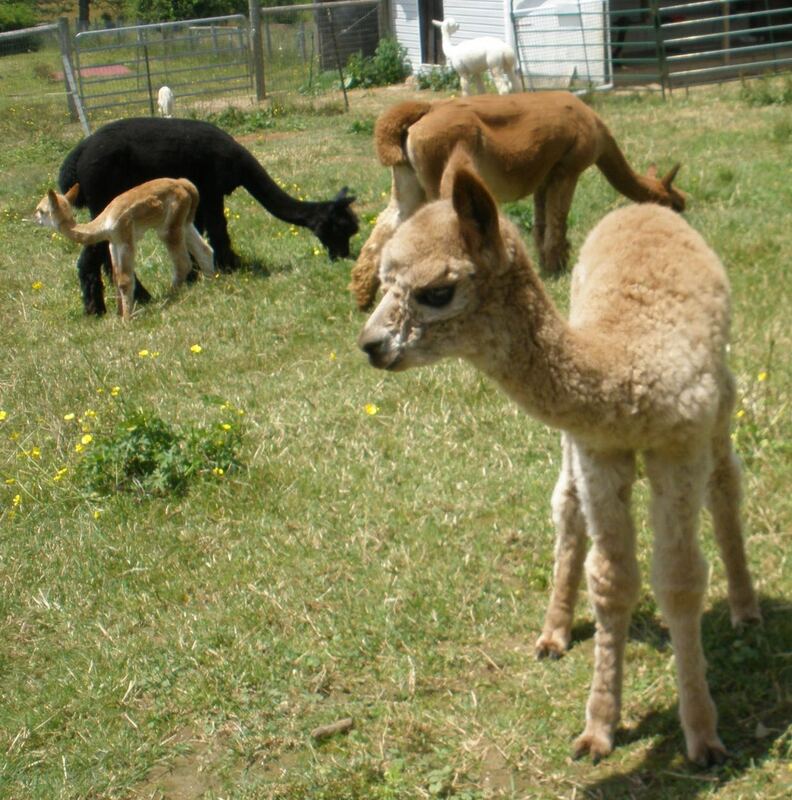 Last year Ruthie gave us a lovely girl named June Delight who you can see in the pasture near the store when you come visit Becket and his buddies. Hope to see you soon. We had to shear May and Coriander yesterday because our shearer (David) is getting ready to go on vacation. It was very windy so we couldn’t shear on the front porch like we did with Milton. 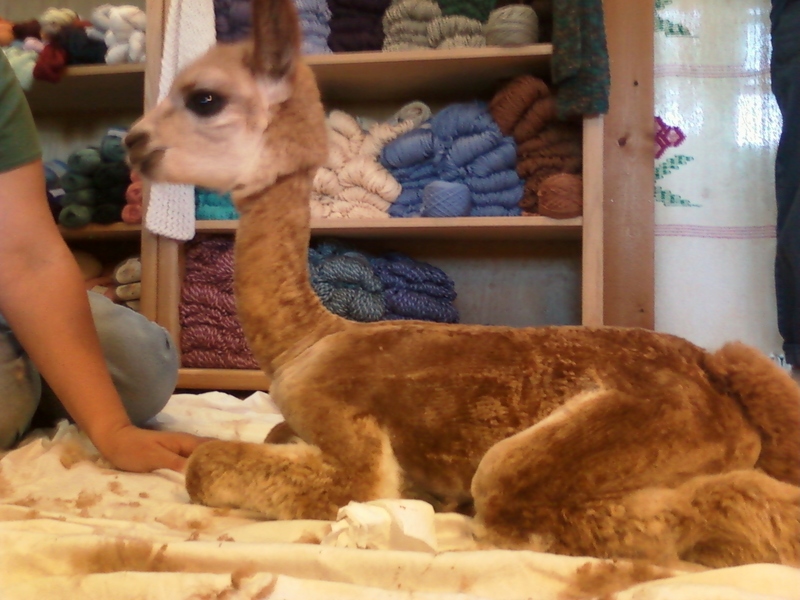 We moved inside to the yarn shop and got their fleeces off quickly. Both are feeling much cooler today. Joyful Joyful (JJ) and Liberte went home to their new farm last week. 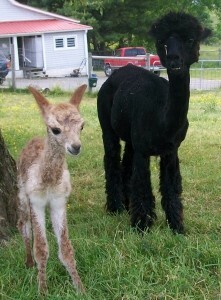 Charles and Barbara Taylor are starting their alpaca farm with these great young alpaca boys. The boys are settling well into their new pasture. 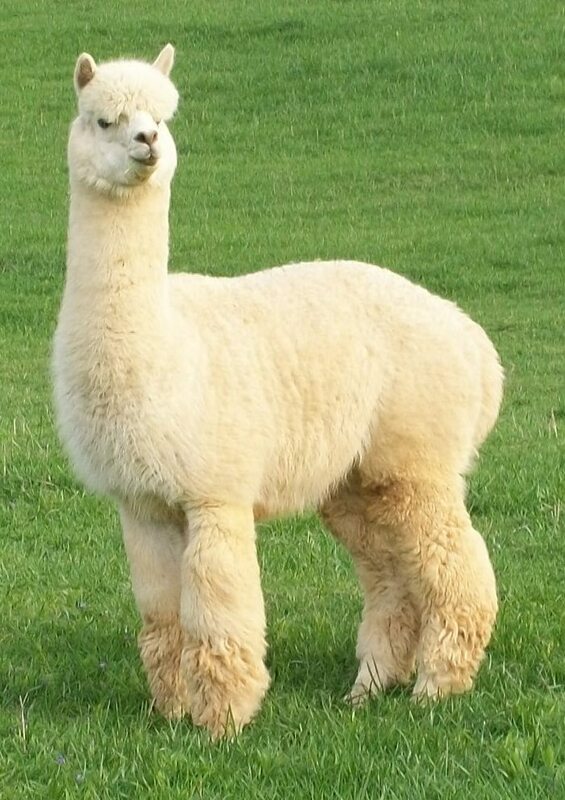 We always miss our alpacas when they move on to new farms, but we are glad to see them go to a farm where they will be loved as much as they are here. 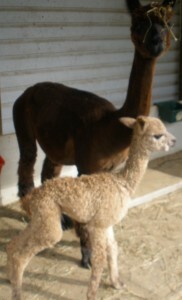 Our third cria for 2011 was just born to our lovely Spice. 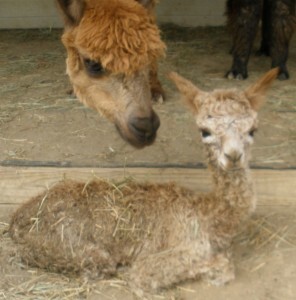 Spice gave birth to a beautiful fawn colored boy at exactly 12:30 today. He is up and running around the pasture already. 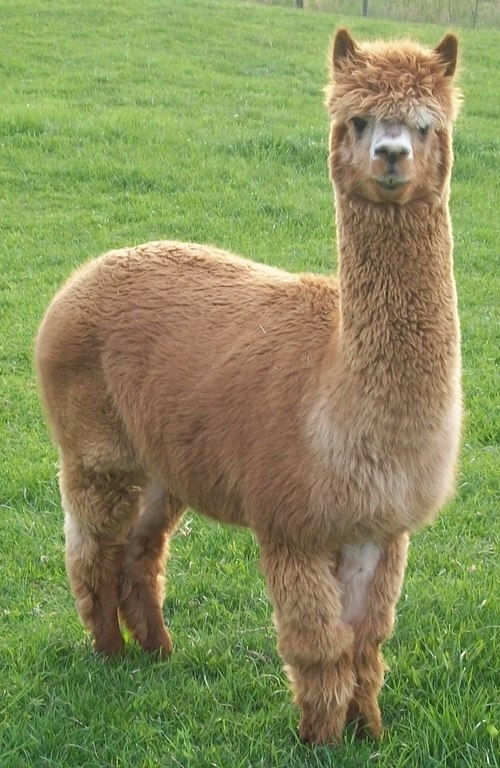 We named him Coriander to fit with the spice theme of his mother and grandmother (Cinnamon). 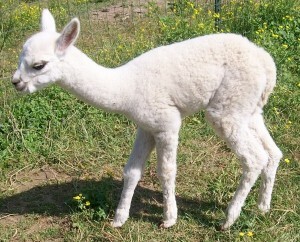 Little Coriander is our second cria this year from our wonderful white herdsire Powergrid. 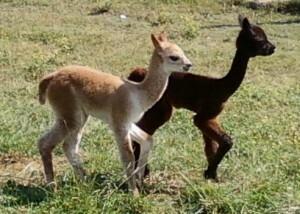 Our other 2011 crias, Milton and May, were quite interested to check out the new cria. We’re just waiting on a couple more crias this year. Come on by to see them all. For those of you on Facebook, ‘Like’ Peaceful Heart Alpacas page to see more pictures of the crias and farm. 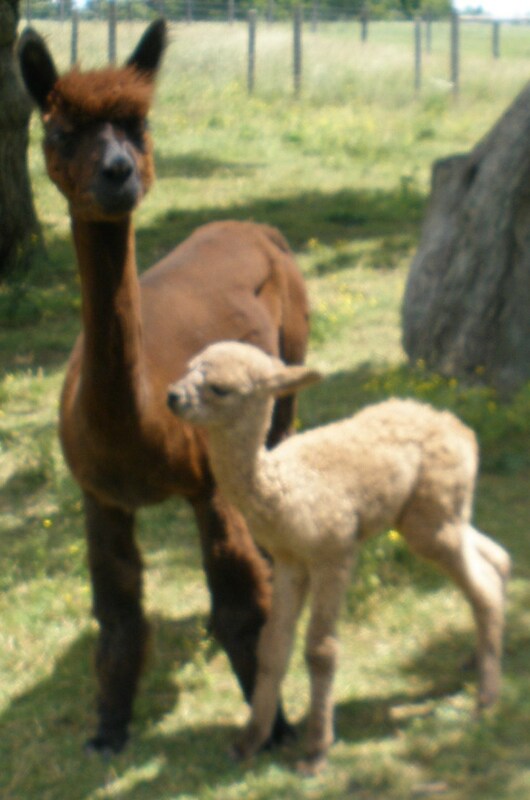 Our lovely Effie Mae has given birth to her first cria and she managed to surprise us. 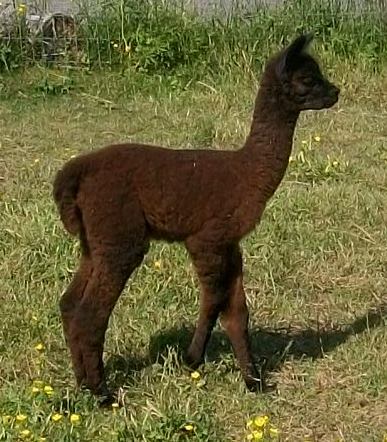 Effie’s markings are so unique, that we have been curious to see what she would produce. 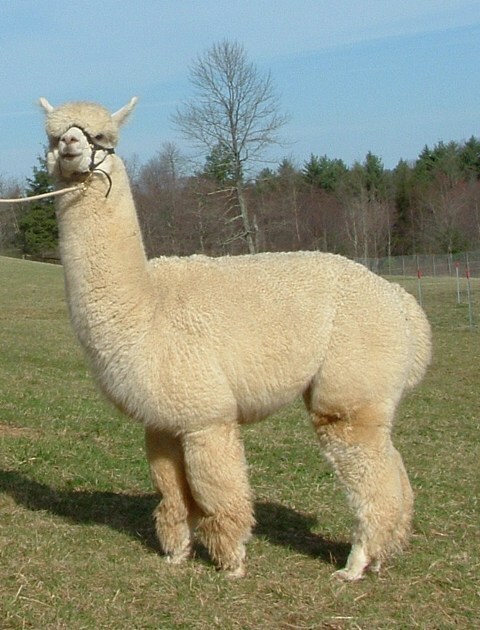 Effie was bred to our award-winning, white herdsire Powergrid last June and we anxiously awaited the results. 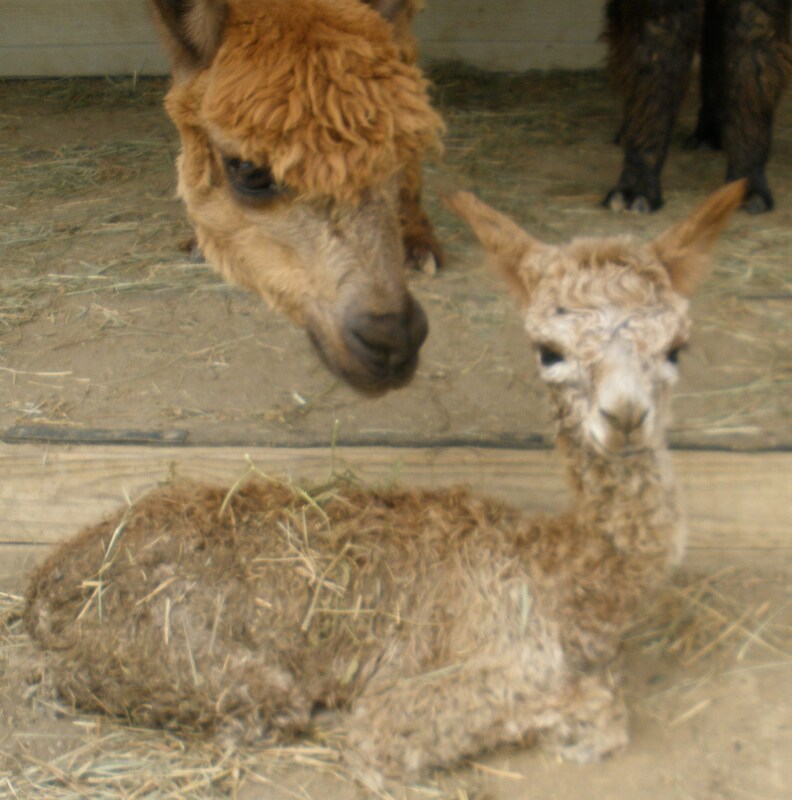 On May 31 at 5 pm (later in the day than alpacas usually give birth), Effie gave birth to beautiful, dark brown May. May is up and running circles around her pasture buddy Milton, though she sticks close to Mom during all non-running moments. 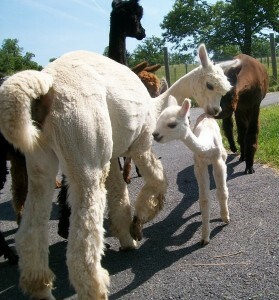 Effie is proving to be as good a mom as her mom Natasha, very attentive and lots of milk. Powergrid has been over to see the new cria, and we assume he is quite proud to have produced yet another lovely girl. 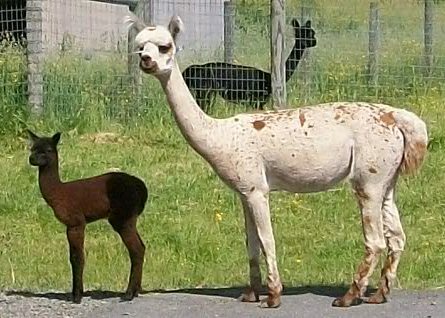 May and Effie are in our front “Mamas and Babies” pasture right near the store. 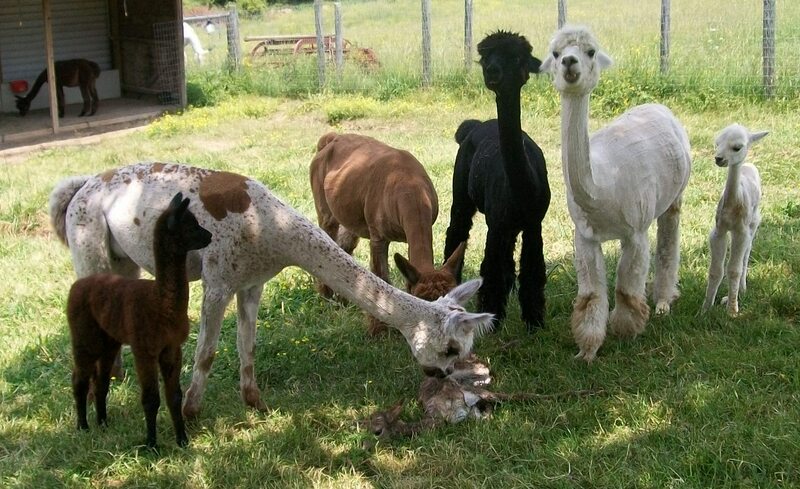 Come on by to see them and Milton. We are awaiting three more crias any day now. Shearing alpaca crias is always a bit scary because of their small size, but is an important part of their care. This year we sheared all our alpacas the weekend of May 7, so our spring crias missed the date. We like to shear our crias when they are about 2 weeks old, and today, Milton’s shearing day arrived. He was born with a lot of fleece like his sire Tennyson, and has gotten quite hot with our warm weather. We set up in the shade of the front porch and brought Milton out to be shorn. 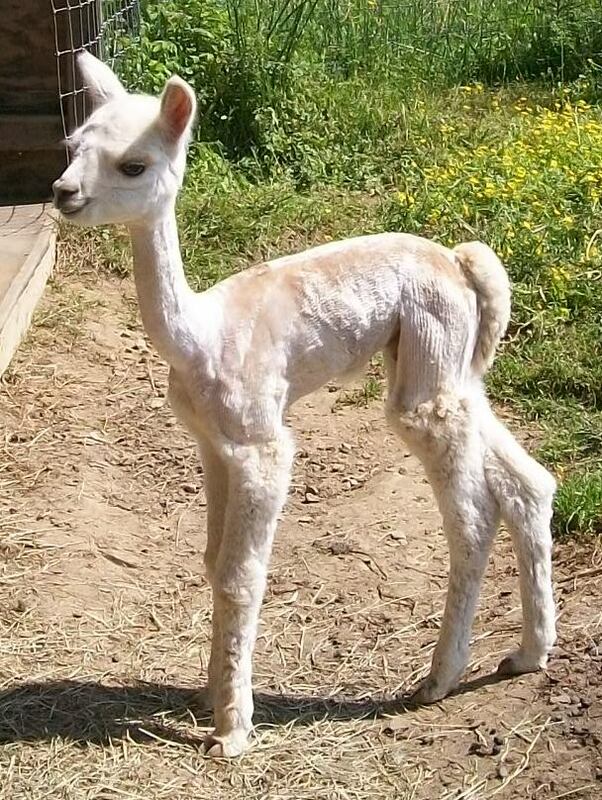 He handled the shearing wonderfully, and laid very still (with some helping hands) while David sheared him. Milton stood up 5.5 ounces lighter. It doesn’t sound like much, but it filled a small bag and he is much cooler. 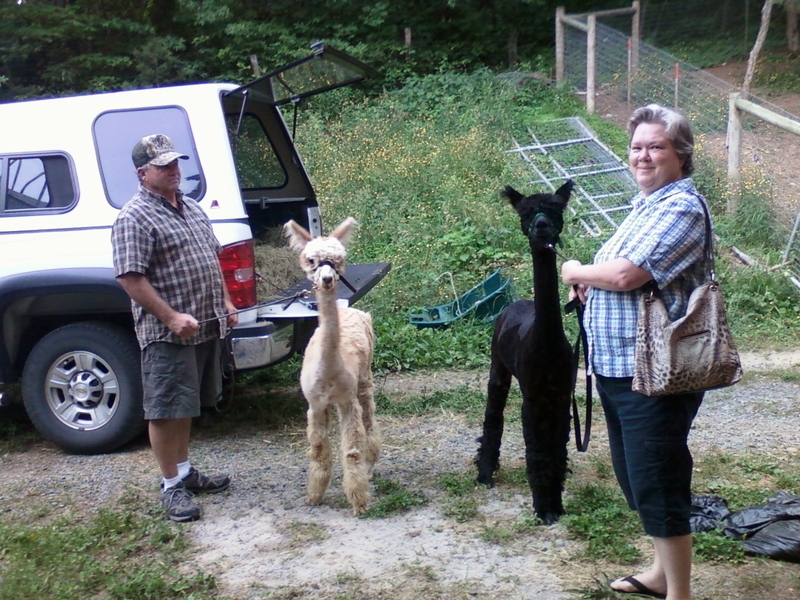 After the shearing, everyone came to check out his new haircut while Milton ran to mom for a bit of comfort. 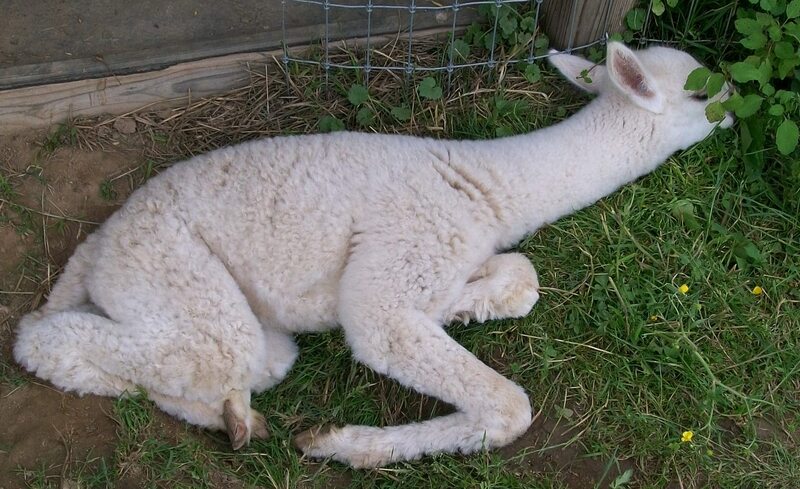 He was back to running around the pasture soon after. Last I looked he was relaxing under his favorite tree.